So, you may remember a couple of years ago, right before my hubby and I ran our first 5k, I bought a new running skirt--called a Sparkle Skirt. (check out Sparkleskirts.com) It's fabulous, beautiful, sparkly and made in the USA! If I had a lot of money I would buy one in every color...or at least a couple more and some of their tech skirts. But since I can't, I was happy with my dark pink one...until I ran across some sequined fabric at Wally World that was only $7.49 for two yards! I don't know about you, but I'm still disappointed that Wal-mart isn't carrying regular fabric by the yard anymore...but at least they have some pre-cut fabrics in various types now (I saw burlap, tulle, cotton, poly, sequined and a few others)! I picked up two yards of the black sequined fabric and went on my merry way. My black fabric with my SparkleSkirt on top. I was excited to get started on my skirt. I first laid out the fabric on my little card table. Then I placed my Sparkle Skirt on top of it for some guidance. 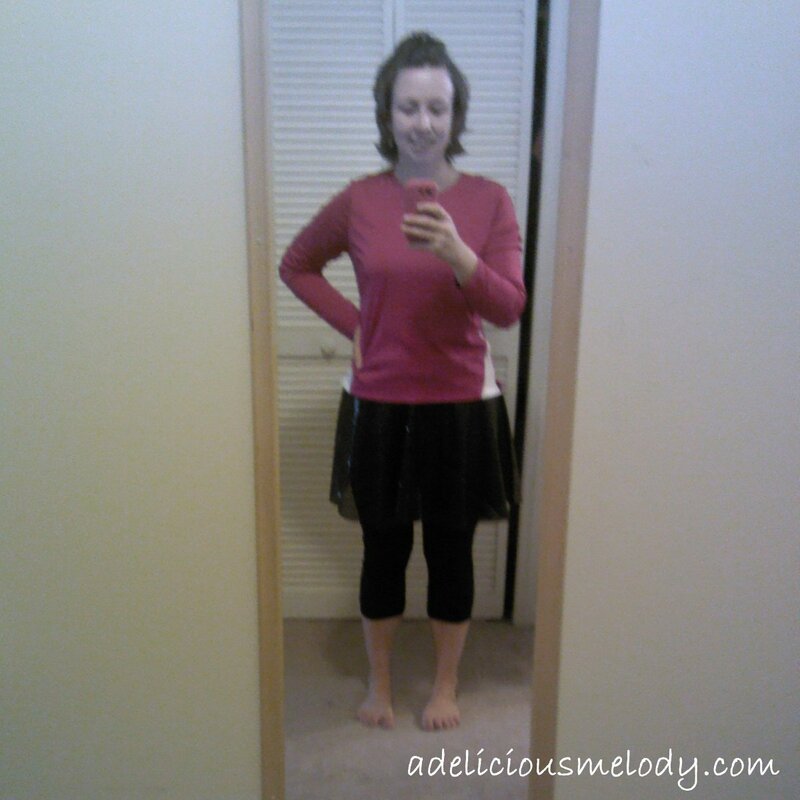 I carefully cut a circle around the skirt out of my black fabric. My circle measured about 36" in diameter. You can adjust this depending on the length of skirt you want. Although, you'd have to probably do some piecing if you want it longer unless you find a wider cut of fabric than I did. :) I cut a line on the radius to make it easier to sew later. I suppose that is an optional step though. Circle cut out with radial line. Then I decided to make a yoga style waistband since I don't have the fancy wicking fabric Sparkle Skirts does. I cut about 8" off of the bottom of an older black tee. Then I cut one seam off to make it one long strip. Bottom of shirt for yoga waistband. Long strip of shirt material for waistband. Here's a close up of the fabric below....cute huh? This would also work for a skirt for a costume or a little girl! Once you have the inner circle cut out, fold the waistband material in half like a hotdog. Then start pinning it around the inner circle. Be sure to pin the outside of the waistband to the outside of the skirt material so that the seams are on the inside. Sew around the waist and leave about 1/4" seam allowance. If you have fancy stitches you can use those...I just used a straight stitch and went around twice. Once you have the waistband attached you can sew the whole thing together. Pin the sides of the skirt so they match at the bottom and then finish off the waistband too. Closer up look at the yoga waistband! Super comfy and cute! Let me know what you think! I hope I didn't ramble on too much. If you have any questions please let me know! :) Happy Sewing! It seems like just about everyone in our neighborhood puts things up for every Holiday. We do for Christmas and sometimes Easter and Thanksgiving but not usually Halloween, except for maybe a pumpkin or two. (Well....I guess we did the first year we were married and lived in Married Student Housing. We even entered a contest for best Halloween decorations that year! Ha!) Anyway, I decided to get a little crafty (actually the last couple days I have been rather crafty--more posts about that to come soon!) 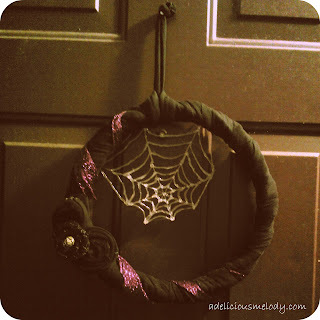 and make a wreath. 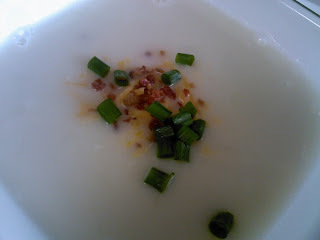 Simply take creamy potato soup and add on toppings like: cheddar cheese, bacon bits, sour cream and green onions. Beat Chocolate Pudding mix and Milk together for 1-2 minutes. Let sit for 5 minutes. Stir in Cool Whip and half of crushed oreos until combined. If using dixie cups put 1 T. oreo crumbs in bottom and then spoon pudding mixture in the cups. 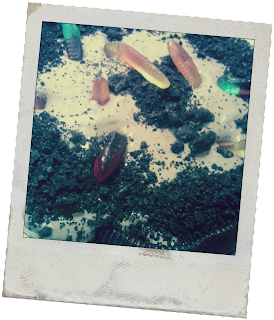 Sprinkle remaining crumbs on top and decorate with gummy worms. If use a pie plate, place ~half of the crumbs in the bottom of the plate and then spoon the pudding mixture over the top. Sprinkle with remaining crumbs and decorate with worms. I have quite the treat for you today! My Mom's cousin just shared her recipe for Chicken Enchilada Soup with me, and gave me permission to share it with you! I need to grab a couple of things from the store before I can make it, but I couldn't wait to share it with all of you! Enjoy! :) And thanks again to M.A.D.!! 2 carrots peeled and sliced in "coins"
Saute in some olive oil until tender. Mix another 1/2 can water with 1/2 cup masa harina**. Mix until smooth. You might need more water to moisten all the masa. Gradually add all the masa mix to the above simmering mixture. You may need to add more liquid depending on how thick you want the soup. Cook for at least 15 more minutes. While hot take off the heat and add 1 C shredded cheddar cheese and stir until blended. Do not return mixture to heat as cheese will curdle. *Note: We like lots of vegetables with our soup so that amount can vary - or you can add no veggies. Depending on the amount of liquid you add, it makes about 4 bowls of soup. One bowl is plenty for a meal and it keeps in the fridge and re-heats very well. **Note: You can buy a 5 pound bag of it (which is a LOT) and now there is a smaller 2-3 pound bag available. Since I make it often, you can portion it out and put it in ziplock bags in the freezer to keep it fresh. And of course you can put the whole bag in the freezer. It's good for making homemade tamales!